What these three families are experiencing in terms of outdoor activities can be just as easily adopted by any other family in the country willing to spend some time together outdoors. With people sometimes having difficulties finding training partners for their map reading/compass practice days and not wanting to venture into the hills by themselves; we're arranging a Kerry & Wicklow Mountain Day for people to meet up and practice their skills in the safety of a group. Outdoors Ireland instructors will not be present on the day, we're simply facilitating the meeting arrangements. Here's the results of a survey we carried out among our customers recently, looking for feedback on what we offer and the level of service we provide. From this feedback we wanted to find areas that we could improve and excel. 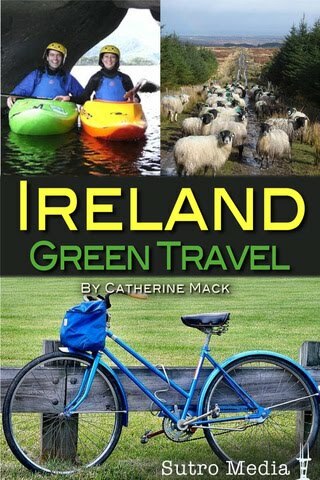 • Ireland Green Travel App is written by leading Irish Travel Writer, Catherine Mack, who specialises in green and responsible tourism. • Featuring over 120 entries of green accommodation, activities, transport options and local food experts, this guide will have you hiking, biking, canoeing and sleeping in some of Ireland’s lesser known green spots - lakeside lodges, yurt camps, island retreats, eco-castles, grand houses with more than just grand green gestures, yoga retreats and community-run hostels. Available for use on iPhone and iPad. • Each accommodation entry has details on how to get there without a car. • Ireland Green Travel App has a handy Slow Travel guide for visitors who want to get to and from Ireland without flying, information on local rail and bus services, as well as how to bring your bike on them, again North and South of the border. • As regular Ethical Travel Columnist for The Irish Times, Catherine is constantly updating her app as she travels the country and its islands, discovering new green treasures. • Price €2.39, £1.79, $2.99. Published by Sutro Media. For further information about Ireland Green Travel see preview http://sutromedia.com/apps/Ireland_Green_Travel or to request a download code for a review copy. 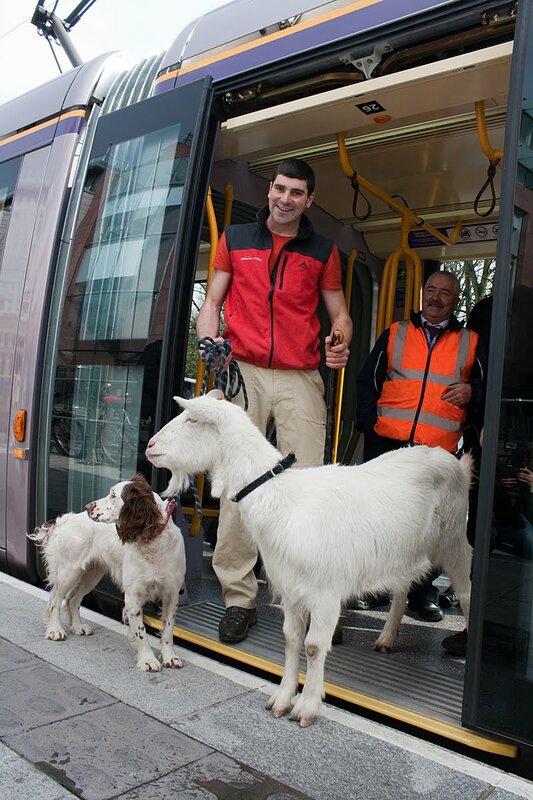 You can also follow Green Ireland Travel at www.twitter.com/greenirelandapp. Received this great letter the other day from one of the places I stopped at on my journey - O Donell's Pub, in County Kilkenny. If you've always wanted to get off the beaten track and explore the mountains properly, but lack the right skills; or if a map has always seemed like a random collection of squiggles, then our Mountain Safety Promotion is for you! The one-day workshops will take place outdoors, in the Wicklow Mountains near Glendalough. All abilities will be catered for, from complete beginners to experienced walkers, together with experienced and qualified mountaineering instructors. You will be given a crash course in map reading, compass bearings, navigation techniques and equipment advice. Hiking boots can be provided, so all you'll need are waterproofs, map, compass and a sense of humor! Here's some of our upcoming adventure trips and training courses... Feel free to get in touch on info@outdoorsireland.com or +353 (0) 86 860 45 63 if you would like any more details. We'd a 5am start, passing this old tower as dawn was breaking. 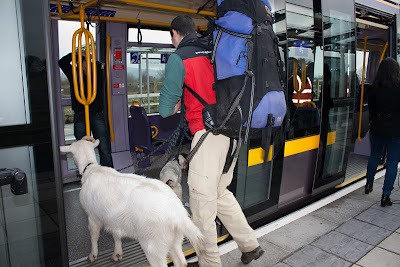 I had no idea how long it was going to take us to travel across the Dublin Mountain Way to the Luas stop at Laughanstown and how long we'd spend wandering busy streets looking for the stop. We've just arrived at the stop, met four of the ticket inspectors, who bought us coffee and now have a bit of a wait until our ride arrives. The Metro Herald did a piece on us this morning, with great images. Reaching Stephen's Green this afternoon, after our 472km hike. This was a group of walkers we met coming over the Wicklow Mountains. It turned out they were actually previous customers. These guys we met stocked us up with flapjacks and bananas! We stayed this evening at Brook Cottage B&B in Enniskerry, near Powerscourt, where Cara was given the huge treat of being allowed to sleep inside! Another early start today following the Wicklow Way in absolutely torrential, lashing rain; crossing multiple fences and thundering streams. I listened to my little radio for a time, but ended up putting it away, afraid the rain would ruin it. We met this really nice woman in the morning, who saw my flask strapped to my bag and insisted on re-filling it with tea for me, and giving the guys ginger nut biscuits. She also thrust a huge bar of dark chocolate into my hand as we said our goodbyes. We came across this river later in the day with the bridge barricaded off and no way over for us, apart from wading, which we were forced to do. Wet boots and socks for the rest of the day! Chris from Tudor Lodge B&B collected us in his Mercedes sparing us the final couple of hours of hiking and that night we certainly all slept well. I got myself a big blackthorn fighting one! Later that morning a van pulled up beside us and John invited us into his nearby house, for ham sandwiches and tea, laced with sugar. Today was an easy day; a short walk later we arrived at our B&B and I popped into the village for a huge plate of bacon and cabbage. Today we started from a spot high above Goresbridge, called 'Nine Rocks'. From here we had a fabulous down-hill descent for what seemed like hours, into a bracing stiff breeze. Wind turbines thrummed nearby, peaking over the pine tops. This is one of the scenic villages we passed through over the day, the church standing prominent over the clustered white buildings. At one point during the day we seemed to disappear off the map, between two different map numbers, and wandered randomly east until stumbling across the tiny and quaint village of Clonegal, just across the Wicklow border. Here we got chatting to several locals, including Brian from the hardware (and everything else) store and re-stocked on supplies, including water and peppermint cream. 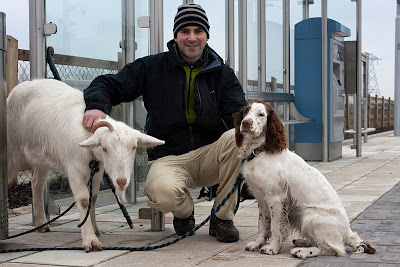 Brian thrust a bag of fresh lettuce into my hand for Lucy and as we retreated past the post office the post-master appeared with a piece of ham for Cara. A long, long walk later, with some failed attempts at hitching, we finally arrived in Shillalagh, courtesy of Liam our B&B owner that night, who saved us the final couple of miles in his small Audi that somehow we all squeezed into with very little trace or mess! Today was a quiet and relaxing day, following old tow paths along the River Barrow all day; meeting no-one apart from a few runners and dog-walkers. We stopped for a pint upon arriving in Goresbridge, at the only pub open there that afternoon. Alice, the bar-tender, was engrossed in a game of cards with all the other bar occupants and served me in between her dealing and betting. Cara was allowed in beside the fire so I wasn't complaining though! That night we stayed in The Almo B&B where Catherine made us more than welcome, cooking dinner, doing laundry and giving the guys a stable and hay. I awoke to thick mist and church bells. By the time we were ready to depart, the mist had burnt off and warm sunshine was pouring over Kilkenny. 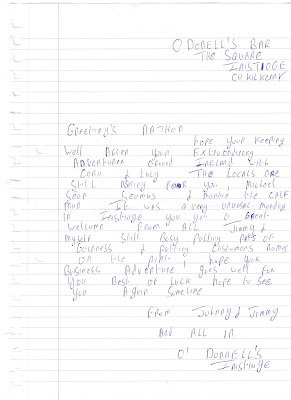 Just as I was walking out of the Inistioge, Johnny and Jimmy waved me down and invited us back inside for a cup of tea. After tea, gold grain biscuits and morning papers we made a second departure. Leaving town an elderly woman stopped and asked what we were doing. When I told her we were walking to Dublin she wanted to know if I was taking Lucy up there to sell her! Part-way through the morning we had several encounters and chats with the local postman, Richard. By the time we descended into Graiguenamanagh that evening, the postman had our B&B alerted to our approx time of arrival and the postman's brother Tony, who runs a little pub called The Cozy Inn, on the look-out for us. 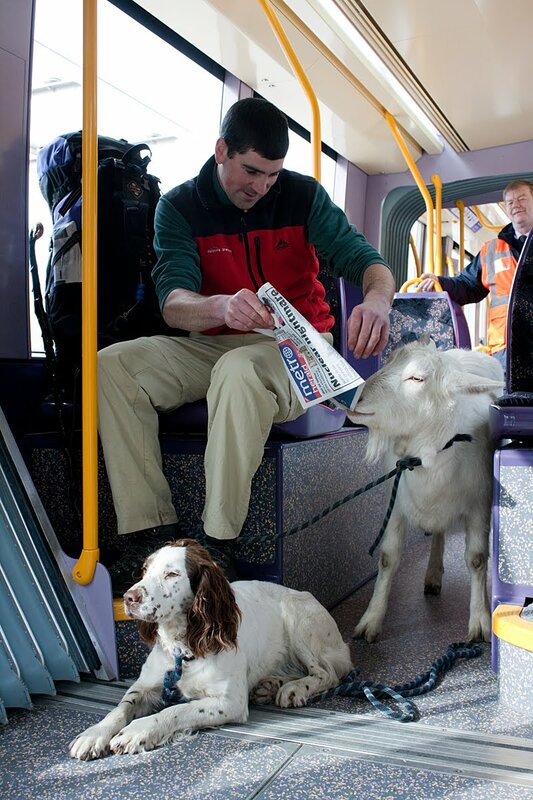 Here's a cross between a goat and a dog we met coming into Graiguenamanagh! We got a lift from Mullinavat part-way along the busier roads that we would have been walking, but still had a long road section to complete that day. I had tried for B&B in Inistioge but everwhere was closed, so we were facing into a major detour off our trail for a night's sleep, followed by a major detour back onto the trail the next day. 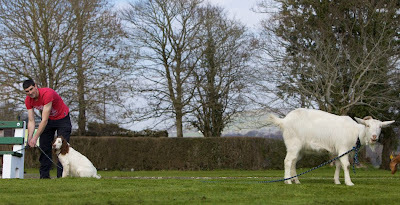 Johnny, one of the two brothers who owns the pub, didn't initially believe me as I asked for a pint bottle of Bulmers, and a bucket of water for the goat, however after some convincing I received both! The day suddenly took a turn for the better as Cara burst in through the front door and swrawled across the floor. Someone called Michael bought me a drink, so I bought him one back, then he bought me another. Suddenly I'd had four pints, all before 2pm in the afternoon, which I don't think I've ever done before - lovely feeling! A little unsure as to my plans, but moving Lucy to the riverside park while I decided my next movements, I was approached by Richard, who offered to open his B&B - Woodstock Arms - for me that evening, despite the fact they were closed for the season. Delighted with the turn of events, which relieved us of all pressure, I returned into O Donnell's to celebrate with Sean and Seamus, with whom I'd made good friends at this stage. 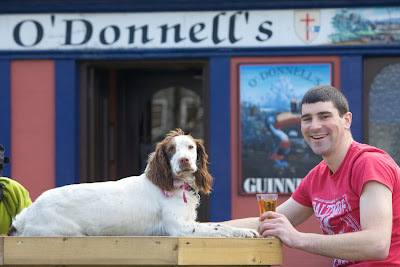 Later that day, as afternoon slipped into evening, we drifted (along with dog and goat) from O Donnell's into the bar of Woodstock Arms. Here Annette, Richard's wife, made me a mountain of toasted sandwiches and Sean and I had ourselves whipped at pool.